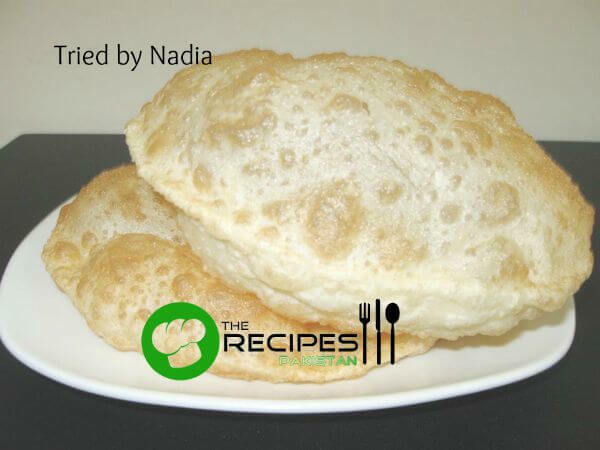 This is tried and tested homemade Poori recipe. Many people want to make it at home, but they think its difficult. In fact this is not, follow this easy recipe and enjoy puri in breakfast with your family. This is a traditional Pakistani recipe of puri, for a different taste you can also make Puri Paratha and for more variation check How to Make Khameeri Puri. All desi recipes are simply superb. Mix flour, oil, salt and yogurt in a bowl and knead a medium soft dough with simple tap water. Leave it for half n hour. Make small balls out of dough and roll into poori. Heat oil in a wok and put poori carefully in hot oil, fry on high flame. You should press the poori while frying in this way poori will rise. Serve with allo chana bhaji, pickle and soji halwa.